Disclaimer: This article was written, and published here as guest blog post,by Hyam Singer, a Toptal VP for User Engagement. It does not necessary reflect the views and opinions of the Networld team. This calculator is based on the cost accounting methodology detailed in the article below. Use the calculator below to compare the real costs of contractors vs. employees, based on their salaries and hourly rates. Andre’s gotten funding for his company and is looking to staff his development team. He needs top software engineering talent and he needs it fast. Andre was ready to bring on Roger, a freelance consultant who came highly recommended, but backed off upon learning that Roger’s rate was $70/hour. That seemed way too expensive After all, Andre reasoned, that’s equivalent to an annual salary of over $145K, based on a typical 2,080 work hours per year. In contrast, Andre is sure he can hire a great developer as an employee for $100K or less. So Andre decides to look for an employee to hire instead and save money. Unfortunately, like all too many hiring managers, Andre’s financial analysis was overly simplistic and highly flawed as a result. The reality is that the costs per employee calculations when hiring are vastly different (and often greater) than those involved in bringing on a consultant, and the differences go way beyond annual salaries and hourly rates. Andre doesn’t realize it, but there’s a good chance he actually would have savedmoney by hiring the consultant. It’s truly astounding how few business owners properly account for the real cost of their labor. In a product company, these errors can eat away at your bottom line. And in a services business, these errors can even result in spending more to provide a service than you’re charging for it. Let’s assume that Andre finds an employee, Pete, for $95K/year. Evaluating costs on an hourly basis, Andre believes that Roger will cost him $70/hour, whereas Pete (using the standard 2,080 work hours per year) will only cost him around $45/hour. Unfortunately for Andre, it’s not so simple when you take employee overhead costs into account. Let’s see why. Most readers of this article will be quick to recognize that Andre has failed to factor in benefits. True. But even when it comes to benefits, things are not so simple. You may be factoring in health and dental insurance, 401K contributions, and other perks, but are you factoring in the cost of the employee’s annual vacation when calculating the cost of the hours that she is productively working for you? OK, that’s closer to accurate, but still a long way from representing Pete’s full cost to Andre’s company. Benefits are frankly only the tip of the iceberg when it comes to figuring out how much an employee is reallycosting your company. And while you don’t charge your employees for any of this infrastructure, they most certainly do benefit from it. That being the case, to the extent that each employee uses this infrastructure, a corresponding portion of the cost is really attributable to him or her. While this is a long list of overhead indeed, it’s important to mention that it’s not even necessarily complete. Many companies will have their own peculiar sets of indirect costs that don’t fall within any of the categories listed above. Collectively, it’s these many indirect costs that can cause a company to inadvertently “lose money” on hiring its employees. OK, so how does one distribute these costs across each of the company’s employees to better approximate their real cost? An overly simplistic way of doing this calculation would be to just add up all indirect costs, divide by the number of employees, and then add that portion of the total to each employee’s annual compensation. While this may seem perfectly reasonable at first blush (and it is certainly much better than not factoring in these costs at all! ), one quickly realizes that it is still way over-simplifying the problem. Consider this, for example: Not every employee uses the same portion of the corporate infrastructure. As an extreme example, the company janitor occupies a much smaller portion of the administrative staff’s time than the CTO does. So attributing equal portions of the cost of the administrative staff to the janitor and the CTO wouldn’t seem to make a whole lot of sense. Even in less drastic cases, the same holds true. A Senior Systems Architect is likely to be using more of the company’s infrastructure than an entry level programmer. The question then becomes how to intelligently distribute the company’s indirect costs across all employees.The generally accepted practice is to use salary as an approximation of seniority, which in turns serves as an approximation of the portion of corporate infrastructure and resources used. But even this is still over-simplified. Fringe benefits. Items such as health care, retirement contributions, paid time off, workman’s compensation, and so on. Overhead. Business expenses not attributable to a specific project. Examples include rent, computer equipment, office supplies, voice and data communication charges, hosting services, and so on. General & Administrative (G&A). Expenses attributable to running your business in general such as salaries for corporate executives and adminstrative personnel, legal fees, accounting fees, and so on. The resulting calculations rapidly become quite sophisticated. For example, these Cost Accounting Standardsfrom the Defense Contract Audit Agency provide a glimpse into the resulting complexity. Using cost per employee formulas such as these, an “indirect rate” corresponding to each of the above three categories is calculated. These are then applied cumulatively to an employee’s salary to derive his or her actual cost to the company. According to a recent Deltek report, the most common values for these rates were roughly as follows: Fringe 35%, Overhead 25%, G&A 18%. Applying these rates cumulatively yields a cost multiplier of 1.99; i.e., (1 + 0.35) x (1 + 0.25) x (1 + 0.18). This means that each employee is typically costing the company roughly twice (1.99 times) their base salary. These multipliers can vary widely, though, across different companies, or even within the same company from year-to-year. In the Government contracting domain, the 1.99 figure is roughly the median, with cost multiplier values most typically being in the range of 1.5 to 2.5. Returning to our true cost of an employee example, Pete’s real hourly cost to Andre’s company isn’t $45/hour; we now see that it’s probably much closer to $90 per hour ($45 x 1.99). On an annualized basis, this means that Pete doesn’t cost the company $95K; rather, Pete roughly costs the company around $190K/year ($95K x 1.99)! Suddenly, this no longer seems like such a bargain. But wait, you’ll say, don’t we have to provide a consultant with some corporate infrastructure too? So isn’t Roger the consultant also really costing us more than his hourly rate? Yes, indeed he is. An excellent point. However, the amount of infrastructure that a consultant uses is significantly less than that of an employee (not to mention the fact that the consultant doesn’t receive any benefits from the company). 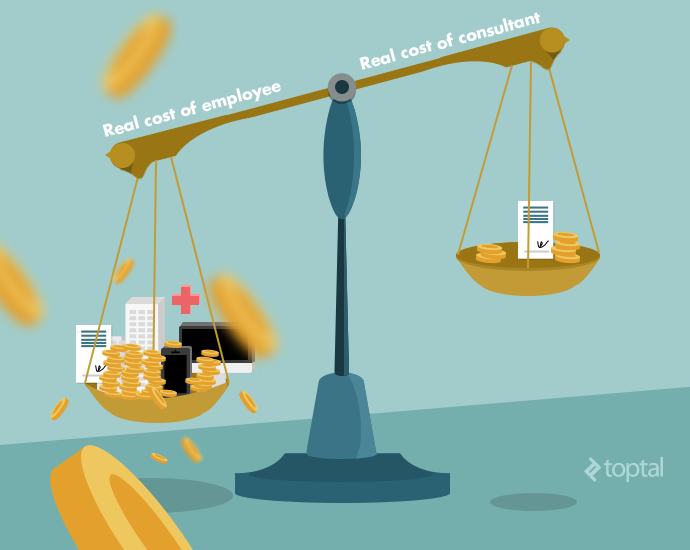 As a result, the actual cost of a consultant is affected by G&A (General & Administrative) costs only; Fringe (i.e., benefits) and Overhead are irrelevant to the cost of a consultant. So, in our example, we can more accurately estimate Roger’s real cost to Andre’s company as being around $83/hour (i.e., $70 x 1.18, based on the typical G&A rate of 18% quoted earlier). This would equate to an annualized cost of roughly $170K (again using the standard figure of 2,080 work hours per year). Andre thought that Pete the employee was only costing his company around $45/hour, whereas Roger the consultant would cost his company $70/hour. Pete the employee is really costing Andre’s company around $90/hour, whereas Roger the consultant would only cost his company around $83/hour. And thus, we prove the old adage that things are not always as they seem. Potential financial risks. There are additional potential financial risks with an employee that are less likely in the case of a consultant. A prime example is the fact that companies tend to make hire/fire decisions much more rapidly with consultants than with employees. It is not uncommon for under-performing employees to be kept on the payroll for multiple months, throughout various stages of probation, to minimize the potential for an employee-filed lawsuit. The resulting cost to the company can be quite substantial. In contrast, companies tend to dismiss consultants with minimal if any notice when in any way dissatisfied with their performance. Recruiting fees affect the cost of all employees. One obvious savings with consultants is the avoidance of often hefty recruiting fees. What may be less obvious, though, is that each recruiting fee paid drives up the real cost of all employees. Since recruiting costs are including in overhead expenses, every recruiting expense that your company incurs increases your overhead costs, which in turn raises your overhead rate multiplier, which in turns drives up the effective cost of each and every one of your employees (i.e., since the overhead multiplier is used in calculating every employee’s real cost, the higher that multiplier is, the higher each employee’s real cost ends up being). When making the in-house employee vs. consultant cost-based hiring decision, it’s critically important to properly account for all the hidden costs per employee and costs per consultant involved in order to make a sound business decision.